When I get to work every day, opening Adobe Photoshop is one of the first things I do. I usually don’t close it until I leave for the day. I use it consistently and still learn something new about it every day. I’m amazed at how much smarts are actually built into it. That’s not to say it’s without flaws. Photoshop is a beast. The application has been through 17 different versions. It’s heavy, and each new version all but requires a nearly maxed out machine to run. I’d imagine there’s a lot of legacy bloat in the app. While I’d love to see Adobe start from scratch and build a lean, mean, new Photoshop, that might not be possible for a number of reasons. The default clusters could match up to the most common use cases for Photoshop: Design, Illustration, Photography, Architecture, and many more. 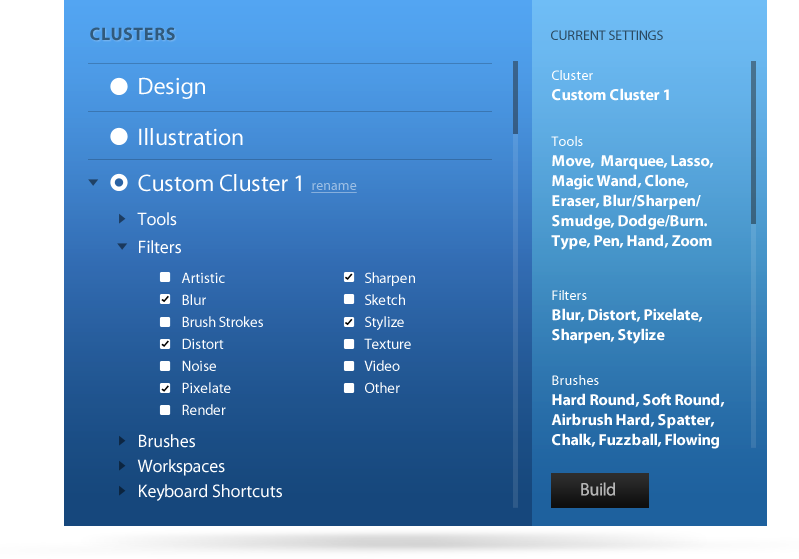 You’d also be able to create your own custom clusters, so that you could quickly retain the Photoshop settings that you like. This could provide for some fast Photoshop experiences: lighter, more nimble builds that are easily rebootable and potentially even reduce crashes. It also could extend to the other Adobe apps, as well as being easily sharable across multiple machines (home, work, etc.) and even to other people. What do you think? Is this possible? A bad idea? Is anyone out there doing this already, either with Photoshop or another app? * This article has been graciously translated into Romanian by Alexandra Seremina, translated into German by Alexey Gnatuk, translated into Russian by Samostroika, and translated into Polish by Katia Osipova.